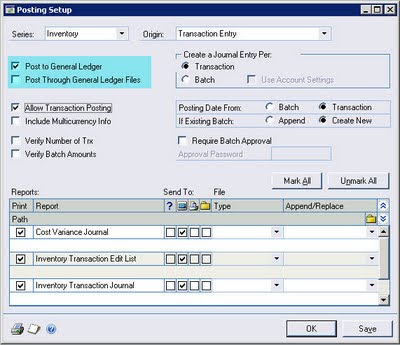 If you choose to Post To General Ledger, batches posted in all other modules will update the module in which the transaction originated, then create a batch of General Ledger transactions. Then you must post those batches within General Ledger as well, to update the posting accounts for the transactions. There is one exception to bear in mind – Bank Transactions – all Bank transactions are single transactions – there are no batches in Banking. However, if you have Bank Transactions set to Post To, a batch is automatically created by GP for each individual transaction. The Batch ID will begin with ‘CMTRX’. You can choose to have General Ledger accounts updated automatically when you post from another module to General Ledger. 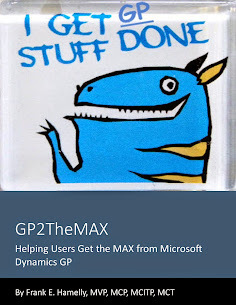 If you mark the Post Through General Ledger Files option, batches posted in other modules automatically update the module in which the transactions originated and the appropriate posting accounts in General Ledger. Note: Single transactions (not in a Batch) Post To General Ledger and not Through General Ledger, even if the Posting Setting is 'Post Through'. A Batch ID is created using the prefix of the Source Document Code for the transaction posted, i.e. 'IVTFR' for an inventory transfer transaction. Also, at least one of the two Posting Settings must be checked or no General Ledger batch will be created.